Bathroom safety is a legitimate concern especially if you or a loved one has limited physical mobility due to age or disability. 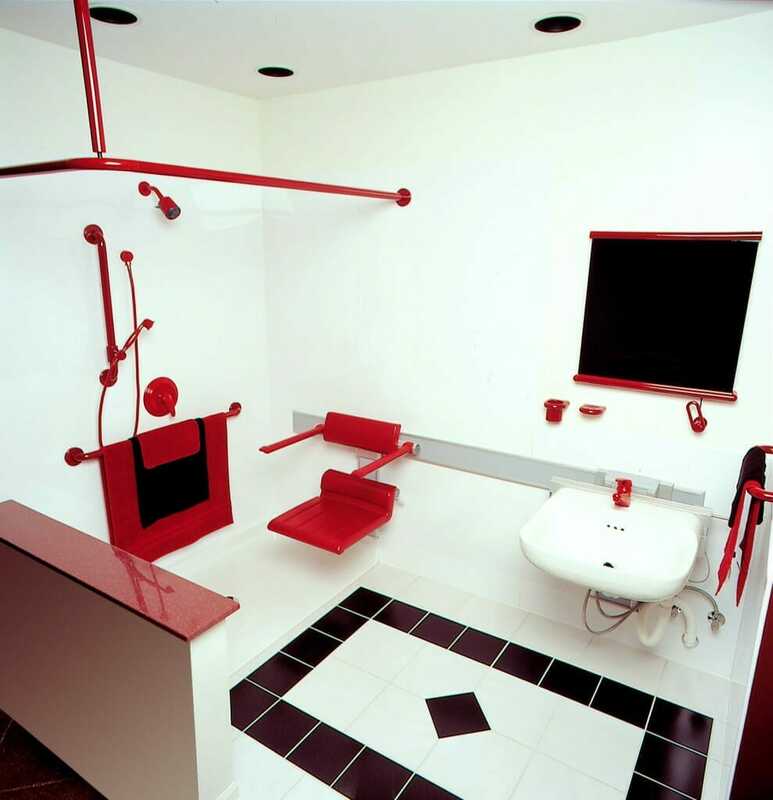 Fortunately there are many options available for bathroom design for elderly access and safety. Installing safety features or a specialty shower or tub will cost less in the long run than medical bills due to injuries that could be avoided by making a few adjustments. Here are some preventative measures you can take with these bathroom design tips to improve safety. Bathtubs can be a prime location for slipping. Between the soap, water and the smooth, curved tub surface, one wrong step can find an aging parent on the floor with injuries. To prevent this from happening consider installing a Walk In Tub. These tubs are designed with a door, a built in seat and are growing in popularity right now. Walk In Tubs are becoming increasingly popular to install to increase bathroom safety for the elderly. In some cases a Safeway Step and Tub Door or a walk-in tub may be needed to allow for easier access for bathing especially if they have to use a walker or a wheelchair. Safeway Tubs are a good option to install in an existing tub for safer access to the tub. Shower stalls are a safer option for people with limited mobility because there isn’t a tub wall for them to step over. This may mean removing the bathtub to make space for a shower stall. If the prospect of not being able to take a bath anymore is a problem there may be alternative options like the Safeway Step and Door mentioned above. In some cases a bathroom has space for both a tub and a shower, in other cases there is only space for one or the other, consider their needs now and in the long run. If they already have a shower stall, it should be inspected for other potential tripping hazards such as a barrier. Shower barriers in some shower designs can present a tripping hazard for some individuals who can’t see very well or who have difficulty picking up their feet high enough to clear even a small barrier. 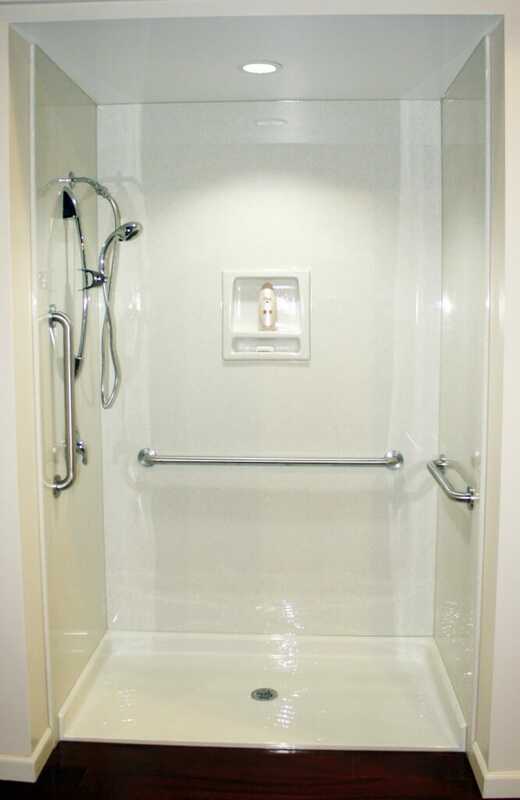 Consider installing a barrier free shower to prevent tripping and for easier walker and wheelchair access. A barrier free shower complete with a hand shower, bench and safety bars. Easily accessible with a wheelchair or walker. If you do decide to install a whole new shower stall, I recommend selecting a model with a built in bench and adequate shelving that is easily reachable from the bench. The less someone has to stand up and sit down the safer they will be. Don’t forget to have grab bars installed in the new shower for added safety for getting up and sitting down. 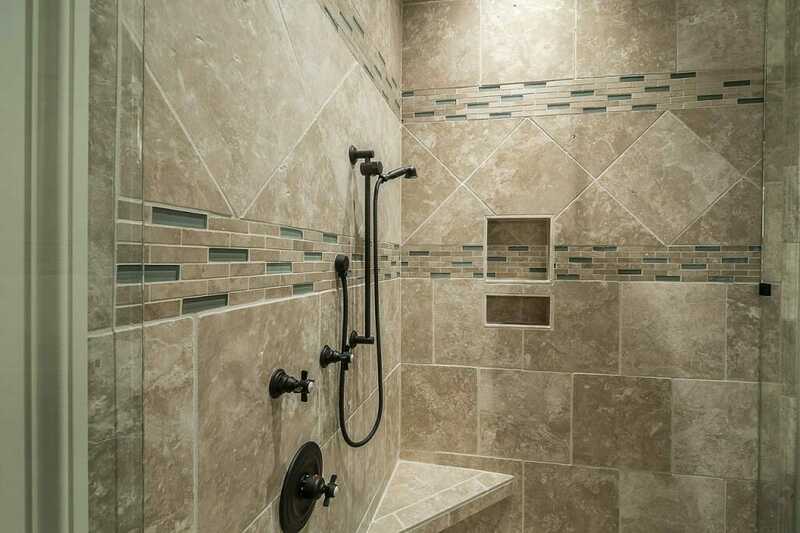 Design the new shower so the shower head and shelves are at arms length from a sitting position. Another detail that will make bathing or showering easier is to install a hand shower with a slid-rail for easily adjustable shower head height. Some models feature adjustable spray settings, look for one with a pause setting so the user can easily pause the water flow as needed without completely shutting off the water. A hand shower will improve anyone’s life, I don’t care how old you are, get one. You will thank me someday. It’s possible to get scalded with hot water in the shower especially in older homes where turning on the water in any other part of the house may affect the water temperature in the shower. For elderly this is a real threat because their senses and response time is slower and they may not realize how hot the water is until they are already burnt. These kind of incidents can be prevented by turning down the temperature on the water heater and by installing a thermostatic mixing valve. A thermostatic mixing valve senses changes in the flow of the two water temperatures and adjusts accordingly to reduce drastic changes in water temperature when someone does something like start a load of laundry while the shower is running. For more ideas and solutions to fluctuating shower water temperature contact your plumber to find a solution and take preventative measures. Safety bars or grab bars are a must for senior citizens and the people with disabilities. Install them in the shower and/or around tub and around the toilet. They may not be pretty but they may mean the difference between independence and injury. Please note that towel racks and soap holders do not double as grab bars because they are not designed to hold a lot of weight. Unlike towel racks and other basic bathroom fixtures, a grab bar is made to be bolted into the studs in the wall and support someone’s weight. Safety bars should be installed anywhere where maneuvering and coordination is required. Toilets can present a challenge for people with physical disabilities and limitations. Thankfully there are fixtures available now to make this process easier including grab bars, as mentioned before, and toilet extenders. Toilet extenders, also known as raised toilet seats or toilet seat risers, make reaching the seat and getting back up again easier because they don’t have to go as far down to sit on the toilet with one of these devices. Some models even come with arm handles which may save you from having to install another grab bar next to the toilet. 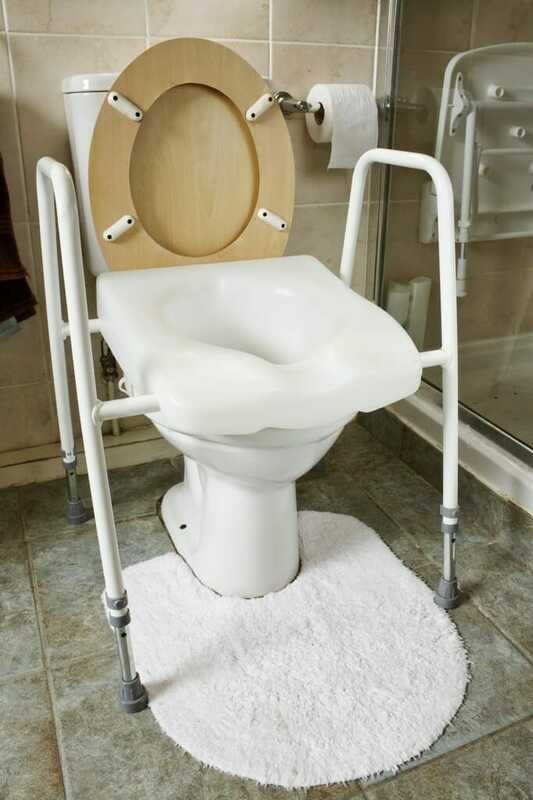 Raised toilet seats with arm handles increase bathroom safety for seniors. Rugs can pose a threat to anyone, but especially seniors. Remove any unnecessary rugs, particularly throw rugs, and make sure all required rugs have a slip resistant rubber backing to prevent tripping and slipping. As rugs get old, the rubber backing can breakdown and wear off over time especially as they go through the washer and dryer. Make a point to check the back of all rugs to ensure the slip resistant backing is still effective. If the rubber on the back is looking flaky, or balding in places it’s probably time for a new rug. Also, when selecting a rug choose one with a low pile to make it easier for walkers and slow feet to pass over and not get caught. With all these solutions from walk in tubs and showers, to shower heads and grab bars there is bound to be a winning combination for your loved ones bathroom design needs that can help increase safety and independence in personal care and make it easier to assist someone who needs help in this area. For more bathroom design tips and ideas, follow us on Facebook, Twitter and Pinterest. Leave us a comment or share a pin, we love to see your ideas. At Bath Solutions we recognize the importance of beauty and functionality. We come up with beautiful solutions for your bathroom design needs and give the project the attention it deserves. We have multiple locations to serve you throughout Canada. Click here to request a free estimate.